It’s hard to see what direction you could point a camera from Rice to get that view of an urban scene at that date. It’s theoretically possible that it was taken later but that doesn’t solve the problem of not recognizing the street grid and furthermore I think it really looks 1915ish. You can easily see that the label at the top is newer than the one on the bottom, which looks to have been contemporaneous with the picture. If you go back and look at the label on the image of the city it’s pretty clear that it was added later too. This makes me suspect that the older Shutts just didn’t look all that closely or didn’t remember accurately where he’d taken that photo. I’m satisfied with that although I’d still like to know what that picture is showing us. I am almost positive there are hills in that photo. 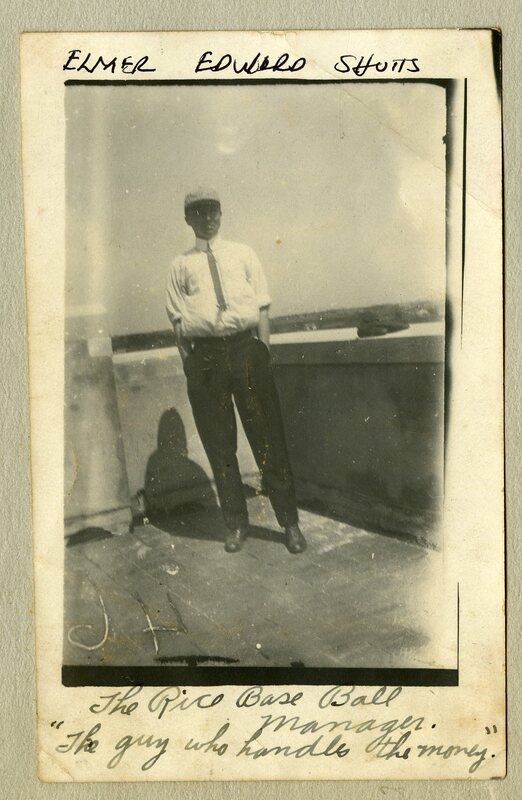 The non-uniform darker background shades on the sides the photo cannot be attributed to vignetting; I believe this might not even be Houston at all. That is totally possible. Shutts was from Lake Charles but you’d think he would have recognized it if it were a picture of home. Otherwise I have no clue. Lake Charles is as flat as Houston. That ain’t Lake Charles. This is going to sound crazy but I have my reasons: is it possible it’s San Angelo? I don’t think San Angelo was that big in 1915, was it? I’m thinking Austin or El Paso assuming hills. My next best guess: If you really zoom in you can see that there is a very large building right in the middle. Add that to the suggestion of hills off to the left and I might be persuaded that this is Austin and the big building is Old Main. 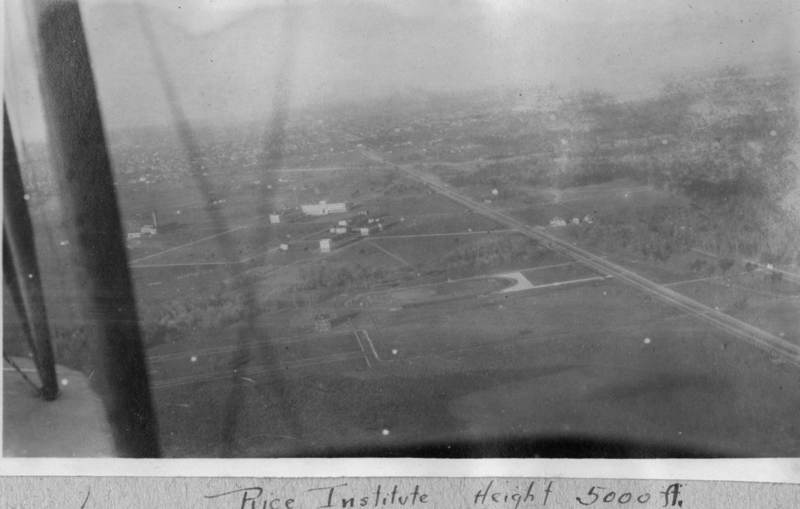 Rice played UT in football in Austin in 1915 and (I think) 1916 so Shutts would probably have been there. I put it on the Facebook thread, but I think this is correct. No question in my mind – that’s Old Main. The buildings to the sides also match up, particularly the one to the left, with the nine windows on the facing wall showing. 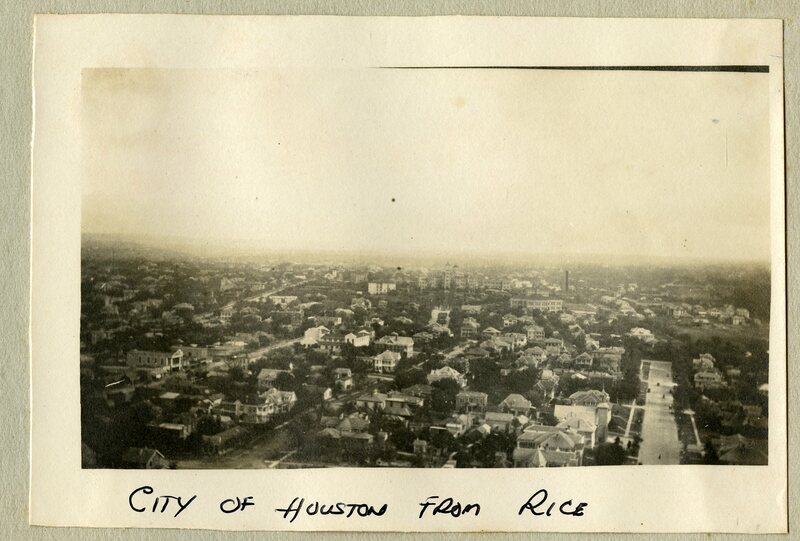 So, sadly, UT beats Rice – yet again..
Here’s a link to an image of Houston A Modern City from the Library of Congress. You can see the Rice Hotel and I think the view from there would be more commercial than residential. Here’s a photo of the Old Main building on the UT campus from 1920. 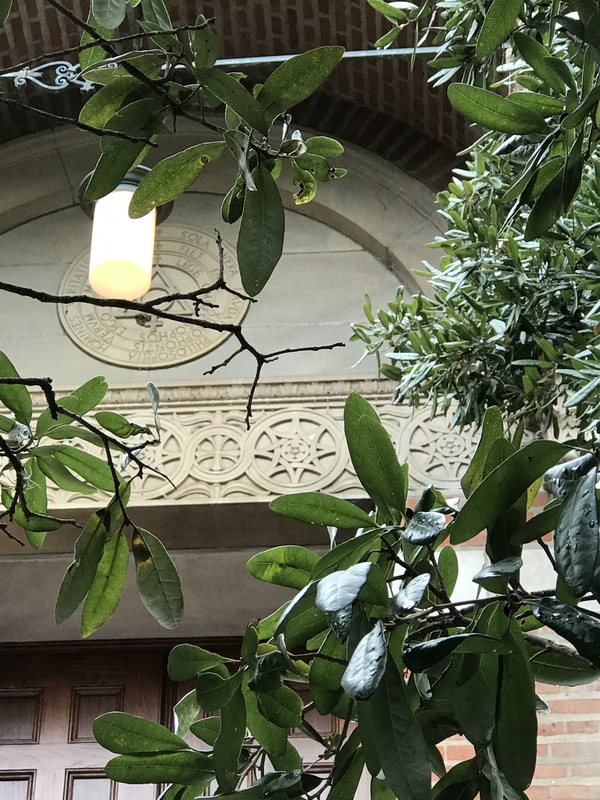 It does look like the building in middle of Elmer Shutts’ photo. You can see the esplanade in front of Old Main in both photos as well as a smokestack to the right of Old Main. He, or someone, may have been doing a batch labeling of his photos and assumed it was from Rice. Look at all the smokestacks along the bayou in the Houston image. Do you know what industries were located there at the time? The Austin picture was most definitely taken from south of UT campus, looking north. Photographer was standing somewhere high up in the Capitol Building. Cool! Isn’t it great that you have a cadre of obsessive research minions?